Welcome to this web site. 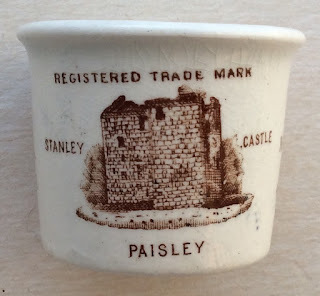 My name is Paul Barker and I have had the collecting bug for Victorian bottles and pots for many years. 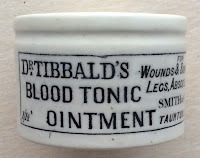 Several internet based sites exist covering the bottle collecting hobby and to compliment these sites, I considered it would be worthwhile to have a specialist site specializing in Victorian Ointment Pots, Edwardian Ointment and Glamour Pots with a section for Delftware Pots. 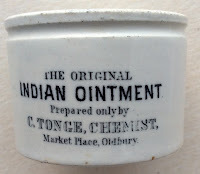 One of the great advantages of collecting Ointment Pots is that being small in size, they do not take up too much shelf space. I started with the relatively common Thomas Holloway pots, the Clarke's pots and the Poor Man's Friend pots from Dr. Roberts. 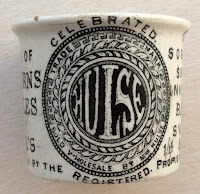 Following visits to specialist regional bottle fairs, I was able to find a few of the more scarcer pots. The collecting bug had taken grip big time and I was hunting high and low for new pots to add to my collection. "getting the first twenty pots is relatively easy, thereafter it becomes an uphill task...!" I certainly have found this to be the case and I am sure fellow collectors will feel the same. To navigate around this site, simply click on the Link 'Pot' buttons at the head of each page and on the Link buttons on the individual pages as directed. The section entitled Victorian Pots has been divided into separate pages to ease your search for specific named pots. Simply click on the pictures of the pot or the short name to be navigated to the relevant page you require. 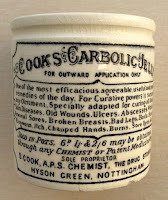 Many of the Victorian ointment pots purported to contain substances that the Victorians' were led to believe provided a cure for a number of illnesses and diseases that were around at the time. 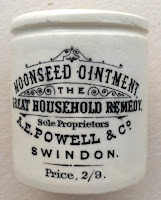 In some cases, the contents of the ointment pot offered no real substance other than alcohol or narcotics and it is quite clear that some manufacturers were unscrupulous in producing a product that was of no real benefit to the user. 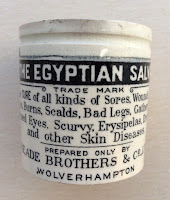 Most ointments contained a type of fat, used as a carrier for a range of active based chemical ingredients. The fats used included lard or beef fat, hogs lard and in some cases, bees wax! 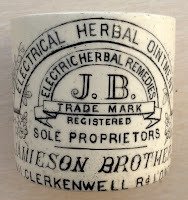 Surprisingly upon analysis, it transpires that the ointment pot of the proprietor Browns, in its Herbal Ointment pot, was found to contain predominantly just petroleum jelly ! The "Poor Man's Friend" which was first sold in 1798, apparently contained lead and mercury. Surely that cannot be good for the health at all! 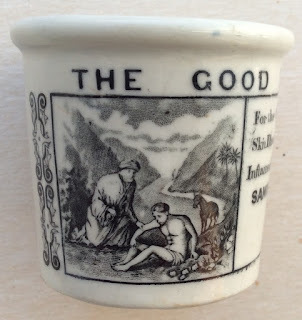 The ointment pots themselves come in various shapes and sizes and are constructed in the main from ceramic and in the case of some of the earlier produced pots, are quite crude in the making and can be very fragile. Many are still regularly found today by eager diggers and it is indeed a wonder how the pots had survived having been discarded in the Victorian rubbish dumps up and down the country. With regard to condition, in view of the fragility of the pots and the fact that a majority have been retrieved from tips after being thrown away, some damage is inevitable and generally deemed to be acceptable, especially where the rarer items are concerned. 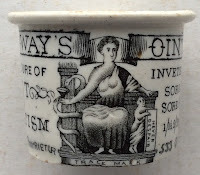 Some pots carry wonderful pictorial transfers and a number of these come with many lines of writing detailing ailments and diseases that could apparently be cured. 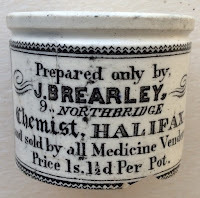 There were a few retailers that produced many variations of pots; both varying in size and price levels, for instance Messrs. Holloway's, Clarke's (Midland & Counties Drug Co) and Reade & Co (Egyptian Salve). 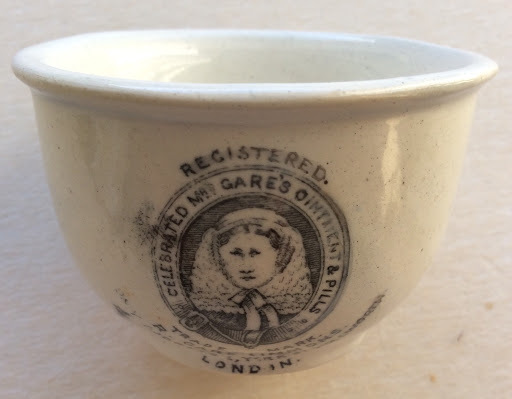 The high price of 33/- (thirty three shillings) is recorded on some pots which was an enormous amount of money in the Victorian times and surely very few people could have afforded to spend so much money on remedies to cure illness. 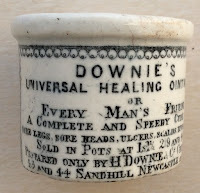 Collectors will have noticed that quite a number of the pots carried a price of 1s 1½d , (one shilling, one and a half pence). You will agree that this seems rather an odd price and can be explained by the fact that the government had levied a tax on all ointments that sold for more than 1/- (one shilling) and therefore the extra 1½d (three half pence) covered the tax duty payable. "Historical Guide to Delftware and Victorian Ointment Pots"
This publication details most of the pots known to exist to-date; provides an immense amount of researched history concerning the companies that produced the ointment pots and is an invaluable guide to those interested in this particular specialist collecting field. A price guide is also included in the publication. Personally I am grateful to the authors for the immense amount of work that obviously went in to producing such a fine reference book. 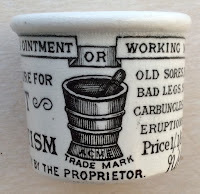 I would be very pleased to add ointment pots to my collection that I do not presently own and accordingly invite you to visit my Wants page where details of the items that I have a desire to acquire can be found. 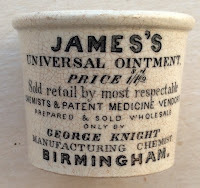 You will find on the For Sale page a selection of ointment pots that are surplus to my collection and hence are for sale. Please Contact me if you have an interest in acquiring any of them. 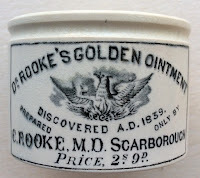 Understandably I am proud of my collection of ointment pots and take pleasure in showing you these delightful pots here in this website. Take time to to look at some of the attractive Ointment Pot Lids too on the pot lids page. To view, simply click here. Throughout the year specialist bottle & collectors fairs are held in various parts of the country organised by either BBR or ABC. Details and dates for the shows for the current year can be found on the Links page. Delftware pots are a specialist category on their own and I have only a few pots in my collection. I would imagine that most are probably held in museums but having said that, I am aware that quite a few pots are held in private collections and on the Delftware Pots page I have obtained permission to show off some of these special pots. And they are WOW! 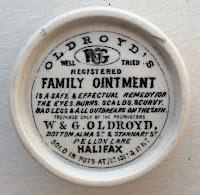 I have also included a page showing ointment pot lids as a related subject. 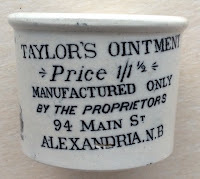 I wish you all great success in your collecting endeavors and I sincerely hope that you will get as much enjoyment as I have with building a collection of ointment pots! If you have any information that you feel may be useful to this site, please feel free to email me. I am happy to share my knowledge of these pots with you so do not hesitate to contact me.